When enhanced tactile sensitivity and consistent grip are a must, make MidKnightTM your glove of choice. 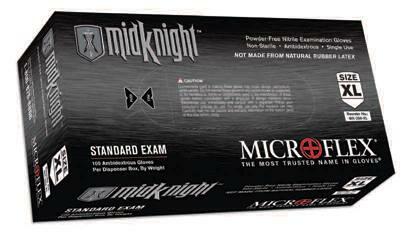 MidKnightTM gloves offer the superior combination of durability and protection against day-to-day hazards, in a comfortable nitrile glove. The glove of choice for individuals who demand uncompromising quality and protection, MidKnightTM provides an exceptional balance of performance, comfort and durability. Designed specifically with a distinct color that resists stains.